From 26 February to 23 April 2016, Galerie m Bochum shows is showing a group of monochrome images by Claus Goedicke. Claus Goedicke (b. 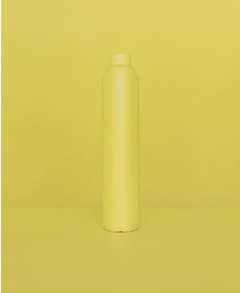 1966, lives and works in Berlin) depicts everyday objects in his photographic work, most recently in his series “Some Things.” He is interested in how the object relates to the pictorial space, and coloration likewise plays an essential role, expressed in a special way in his monochrome pictures (2001–2003). 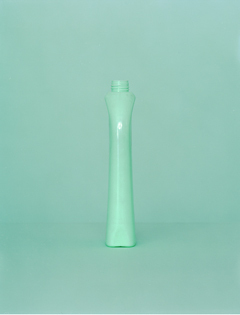 For years, Claus Goedicke collected empty plastic bottles of different colors and removed their labels in order to then stage them in his photographs. He finds photography to be the predestined medium to do justice to the specific material qualities and coloring of this type of object. The opaque bottles are positioned front and center in the pictures, illuminated by changing degrees of daylight. The background matches the color of the respective object in each case. This monochromy in conjunction with a horizon line that is accentuated to varying degrees reduces the depth of the image and makes the bottles seem to pulsate, fusing with the same-color surfaces around them and yet standing out plastically from their surroundings. The plastic material and its coloration absorb the light and color of the surrounding space. “The plastic containers are the protagonists in my research into the possibilities of color in photography.” The reflections that play across each object’s surfaces delineate its shape and enhance the impression of plasticity. The eye follows the gradually developing color, the tonal nuances that subtly hint at the contours of the space and the lighting conditions. At the same time, however, the viewer keeps getting caught up in details that interrupt the flow of pure observation: the threads of the bottle openings, seams that bear witness to the production process, or pressure points left behind by the bottle’s use. This conjoining of purely artistic considerations with a documentary approach, incorporating influences from applied photography, encourages us to see the world of merchandise that surrounds with new eyes. The original everyday function of the objects remains at the back of our minds despite their abstraction, so that the images are perceived both as autonomous pictorial inventions and as documents of their times. Claus Goedicke’s monochrome photographs thus hone our perception. The reduction of the image elements and the subtle pictorial information provided enable us to focus on the themes of color, form, light and materiality.